If you are writing medical dramas, steampunk, techno-thrillers, or any sort of science fiction, then you will want to pick up a copy of Putting the Science in Fiction. The breeze from the southeast rippled the black water of Tongu Harbor and the only sound was the muffled clunk of the oarlocks and the quiet dipping of the oar blades as I rowed us toward Plumbelly. It was after midnight and I looked around at the silhouettes of the other boats moored in the darkness, hoped their crews were asleep, or drunk, or both. Tanya sat behind me in the bow of the skiff and Lloyd in the stern, each of us wrapped in our own silent thoughts, as sailors are wont to do on the eve of departure. It was a short row and I shipped the oars and glided alongside the sloop. Without a word, we threw over bags over the rail and climbed aboard. "That was the problem with giving advice-it always sounded too easy. Life didn't change course based on greeting card hype and cheery generalities. You had to dig down to the pivot point, the thing on which everything relied and nudge it in a new direction." 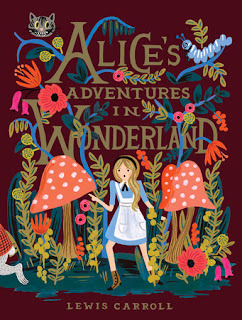 Alice's Adventures in Wonderland is a great American Read even though the book is British. We're all familiar with the characters: Mad Hatter, Queen of Hearts, and Alice herself. Indeed, reading Alice is curious and curiouser. Why is this book a Great American Read, since it doesn't fit the idea of a novel, or even a children's book? For one thing, Alice has been around for over a century and never gone out of print. Again - why? As a child, I remember loving its illogic - and logic. There was problem solving throughout the book, of a surreal sort you might find inside an Escher drawing. It was as though a deck of cards came to life along with White Rabbits and a sleepy dormouse. In college I reread the book on an entirely different level, that described by Jefferson Airplane. Then I realized just how hallucinogenic Carroll's book was, giving wild new meaning to scenes I'd read with complete gravity as a child. And when I read the book out loud to my daughter, its sly humor struck me. The scene when Alice grows as large as a house and kicks poor Bill out of the chimney is just so - satisfactory. What child wouldn't love to control an entire household? Who wouldn't want to shrink or grow at will? Just LOOK at the expression on Alice's face. But there are elements of horror as well - that feeling that anything could be around the corner, that everyday items might get up and walk around or talk to you. And then there are the poems, Father William and How Doth the Little Crocodile. And the illustrations are perfect, little etched views into an alternate universe. 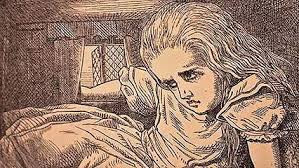 It strikes me that Alice can be what you want it to, not just a child's story. Each time I've read it the book is completely different, depending on my mood and situation. In a way, Alice's Adventures is a looking-glass, reflecting what we bring to the book. 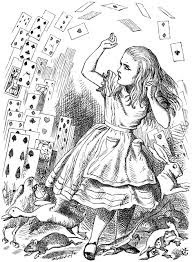 It is this, therefore, that makes Alice a Great American Read. President Teddy Roosevelt loved Carroll's writing and quoted The Hunting of the Snark to a bewildered Cabinet: "What I tell you three times is true." If you haven't read it, do get a copy and give Alice a try - and Audible is a great way to experience the book. The Center squatted on the corner of Juniper and Montfort behind a wrought-iron gate, like an old bulldog used to guarding its territory. At one point, there had been many like it in Mississippi - nondescript, unassuming buildings where services were provided and needs were met. Then came the restrictions that were designed to make these places go away: The halls had to be wide enough to accommodate two passing gurneys; any clinic where that wasn't the case had to shut down or spend thousands on reconstruction. The doctors had to have admitting privileges at local hospitals - even though most were from out of state and couldn't secure them - or the clinics where they practiced risked closing, too. One by one the clinics shuttered their windows and boarded up their doors. Now, the Center was a unicorn - a small rectangle of a structure painted a fluorescent, flagrant orange, like a flag to those who had traveled hundreds of miles to find it. It was the color of safety; the color of warning. It said: I'm here if you need me. It said. Do what you want to me; I'm not going. In the aftermath of Amandine's betrayal, Toby and her fragile found family have fallen apart. She does what she does best: continues to play Faerie's knight errant and ignore the tangled knot of feelings she feels unable to unravel. That never really works for long, and this time it's because her human daughter Gillian was abducted. There are signs of Fae involvement everywhere, and so few fae actually remembered that she actually had a daughter. This means it's part of a larger conspiracy, and it's a race to find Gillian before she pays with her life. Women's fiction is an umbrella term for women-centered books that focus on women's life experience that are marketed to female readers and includes many mainstream novels. The Romance Writers of America organization defines women's fiction as, "a commercial novel about a woman on the brink of life change and personal growth. Her journey details emotional reflection and action that transforms her and her relationships with others, and includes a hopeful/upbeat ending with regard to her romantic relationship"
At the Women's Fiction Writers Association women’s fiction is described as a story where the plot is driven by the main character’s emotional journey. Women’s Fiction includes layered stories about one or several characters, often multi-generational that tackles an adult character’s struggle with world issues resulting in emotional growth. It may include elements of mystery, fantasy, romance or other subgenres, but is not driven by these elements. The writing is high quality and accessible.